A delicate exposition of the complex relationship between Heidegger and Theology in all its complexity. ^^The relationship between Heidegger and Theology is a complex one that is not easy to define. It unifies several strands in Heidegger's thought that have rarely been brought together in one place. First Heidegger's Catholic origins, next his flirtation with Mediaeval mysticism and his so-called 'conversion' to Protestantism. Underlying this is his reading of the Greek understanding of the divine. ^ ^Perhaps the most important part of this is Heidegger's discussion of what he variously called 'the atheism of phenomenology', the 'christianisation of philosophy' and his analysis of Hegel and Nietzsche as 'ontotheology' and as 'the end of metaphysics'. The book concludes with a discussion of the principal theologians who have engaged with Heidegger, and also an examination of theology's possible future engagement with Heidegger's work. Martin Heidegger is the 20th century theology philosopher with the greatest importance to theology. Acradle Catholic originally intended for the priesthood, Heidegger's studies inphilosophy led him to turn first to Protestantism and then to an atheistic philosophical method. Nevertheless, his writings remained deeplyindebted to theological themes and sources, and the question of the nature of his relationship with theology has been a subjectof discussion ever since. This book offers theologians and philosophers alike a clearaccount of the directions and thepotential of this debate. It explains Heidegger's key ideas, describes their development and analyses the role oftheology in his major writings, including his lectures during the NationalSocialist era. 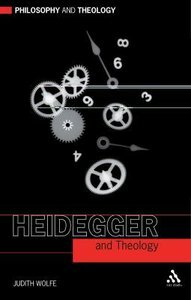 It reviews the reception of Heidegger's thought both bytheologians in his own day (particularly in Barth and his school as well asneo-Scholasticism) and more recently (particularly in French phenomenology),and concludes by offering directions fortheology's possible future engagement with Heidegger's work. About "Heidegger and Theology (Philosophy And Theology Series)"
Laurence Paul Hemming (Ph.D., University of Cambridge) is Senior Research Fellow in the Institute for Advanced Studies of the Faculty of Arts and Social Sciences of Lancaster University, UK. He is the author of Heidegger's Atheism: The Refusal of a Theological Voice (Notre Dame University Press); Postmodernity's Transcending: Devaluing God (Notre Dame University Press and SCM Press); Heidegger and Theology (T&T Clark) and Worship as a Revelation: The Past Present and Future of Catholic Liturgy.